SUMMARY: After she saves a squirrel from certain death, Flora and her friend William Spiver discover the squirrel (named Ulysses) has special powers including the ability to type, write poetry, and fly. Told partially in cartoon format. WHAT I LIKED: I am a huge Kate DiCamillo fan, so I was really excited to see that she has a new book coming out this month. 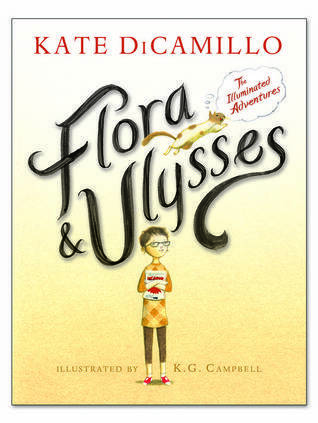 As an extra bonus, Flora & Ulysses is told partially via short, full-page cartoon strips, which will make it especially popular with 8-11 year old readers. DiCamillo's skillful use of vocabulary will help expose readers to words they likely have never seen. The squirrel is super-cute and the drawings made me smile. I loved his thought captions, where he is always thinking "I love Flora" or "I am hungry." I loved reading his poetry, which sounded just like what Ulysses might need to say. Judging by the massive early praise I've seen for this title, I know this will be popular with upper-elementary teachers. It is definitely unique, and the superhero theme is always a hit with young readers. Children will love the drawings and will laugh at Ulysses the Squirrel, who is just so darn cute that readers will want to adopt a superhero squirrel of their own. WHAT I DIDN'T LIKE: Overall, I am disappointed. I expect a lot from my beloved Kate DiCamillo, but I had a hard time caring about this story. While there was some action (mostly surrounding the antics of Ulysses), I had to make myself read this. I kept thinking it would get better (it's KATE DICAMILLO! ), but for me, it never did. I was actually happy to finally finish it. All the characters are quirky, but Flora and William Spiver (he goes by his full name) are so quirky that they got annoying. How do these 10-year old kids (or are they 11?) know so many SAT vocabulary words? How do they know how to use them correctly and off-the-cuff like that? How did so many quirky people find each other living in the same approximate area? I'm also not really sure the point of the story. By the end, very little had changed, except possibly Flora's mother's attitude toward Ulysses. There were some minor changes in understanding between Flora and her divorced parents, but even those changes were not a huge deal. THE BOTTOM LINE: It's too cutesy for me, but I do think this will be very popular with upper-elementary and lower-middle school teachers and students. I hope to see many more books for young readers that feature this graphic-text format; it's perfect for struggling readers. STATUS IN MY LIBRARY: On order. There is definitely an audience for this at my school. This was way too quirky for me. I'd have students pick it up for the pictures, but don't think this would make many of my middle school students happy. My name is Meg and I run a site called Booknixie.com. I was looking for reviews of Flora and Ulysses to share on my site and I came across your post... If you're open to it, shoot me an email at meg(at)booknixie(dot)com.